You can place a 'port-numbers.txt' file into the same directory as 'Yale.exe' to extent the know protocols. The format is the usual rfc format. Please note that a expanded network adapter reduces your network speed since every network packet is parsed by Yale. 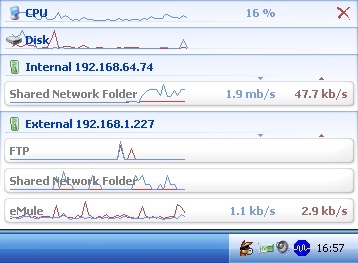 The window shows the bandwidth usage of all network adapters. Separated into up and down link. Additional the cpu usage and disk transfer rate is shown. You can click onto the network adapter entries. This will expand them and show you the bandwidth for every used protocol.